83’ is an upcoming Hindi movie directed by Kabir Khan and produced by Reliance Entertainment. 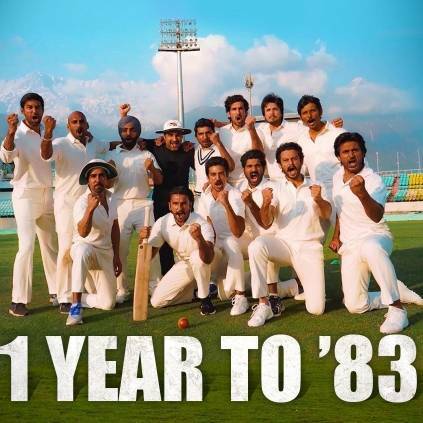 It is a sports film that revolves around the story of Kapil Dev and his cricket team leading the Indian side to victory in the 1983 Cricket World Cup. Ranveer Singh will play Kapil Dev in this film and Jiiva is set to play the role of Krishnamachari Srikkanth. The entire cast is now undergoing rigorous training in Gurugram to train themselves well in Cricket. The latest news is that the movie is set to hit the screens on the 10th of April 2020, which is exactly one year from now. This movie is set to clash with Thala 60, which is also sceduled to release on the same day. Actor Jiiva took to Twitter to share this news. He posted a picture of the team, with a caption that read “1 year from today, relive India’s greatest story. #Relive83 Releasing on 10th April 2020! !” 83’ stars Ranveer Singh, Jiiva, Pankaj Tripathi, Tahir Raj Bhasin, Saqib Saleem and Chirag Patil in lead roles. Stay tuned for more updates on this biggie. Popular Tamil Star Jeeva To Join Ranveer Singh For Hindi Multistarrer! People looking for online information on 83 movie, Jiiva, Ranveer Singh will find this news story useful.